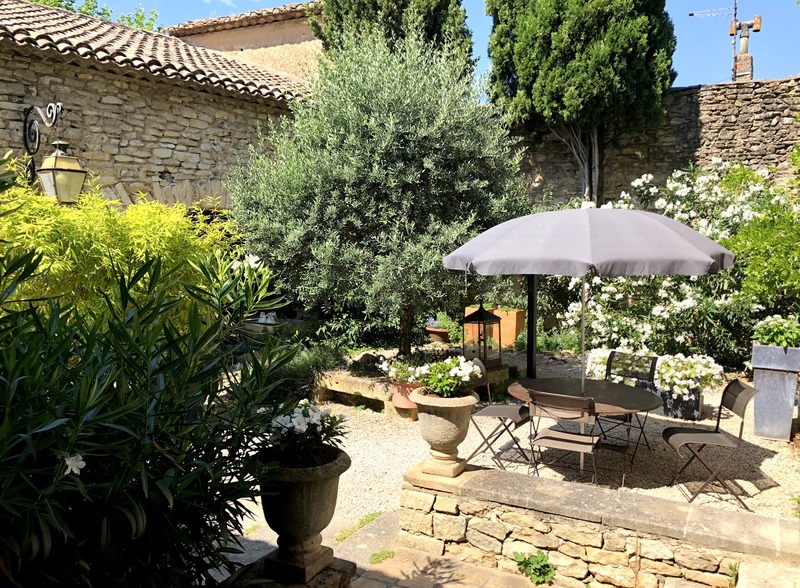 Upon stepping foot in my vacation rental just two miles outside of Gordes, nestled in the countryside and surrounded by vineyards, my breathing deepened, and a long sigh was exhaled. With no set plans for the foreseeable duration of my stay at this particular destination, I nestled in and played as though this “home” was my own. 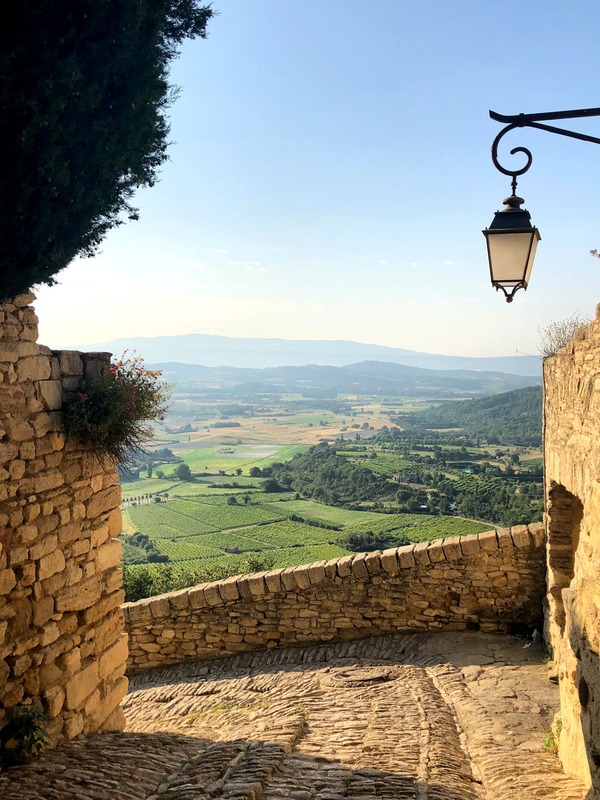 Except this time, my home was in Provence, specifically the Luberon region. It is impossible during my opportunities to travel for my mind not to seek and eventually find deeper insights into what I am seeing and experiencing. To ask the question repeatedly, how would this experience be possible to recreate, the feelings I am feeling, the sensations that my body is comforted by, when I return home. And while some may say, it is impossible, after all, there is only one Provence, I would agree insomuch as to acknowledge, there is only one Provence which is what makes it special. 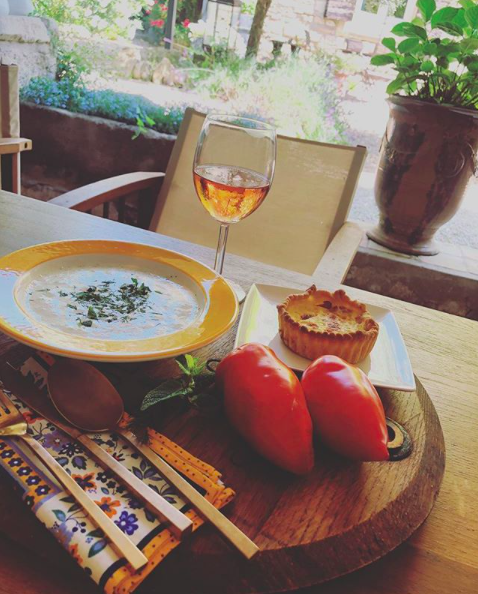 But Provence shares its goodness with us, and for us to return to our year-round home without taking the gifts it offers, the lessons it wishes to share, would be to not acknowledge that we can bring aspects of the Provence way of life into our everyday routine. Let me explain, as I have been practicing each day while I have been here, the art of slowing down, of savoring (episode #213). 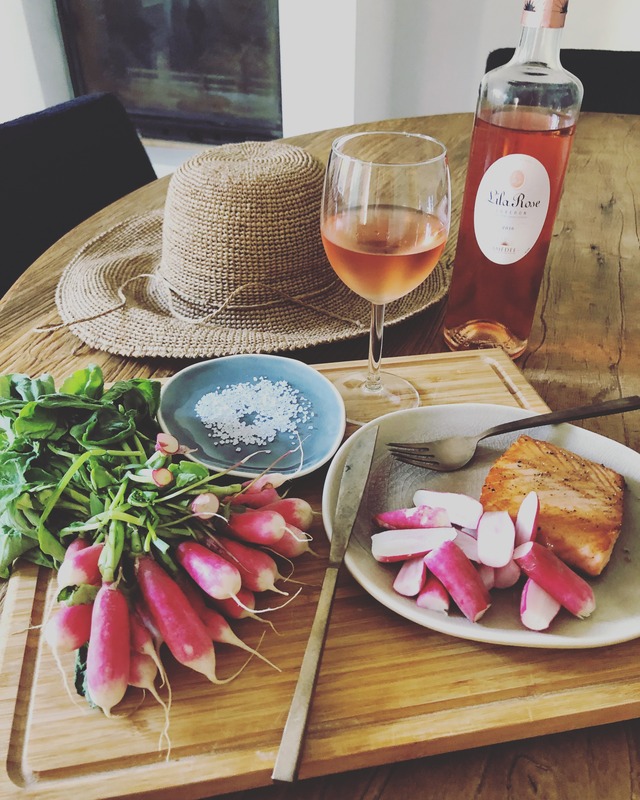 A bundle of fresh radishes from the local market with salt for dusting, a fillet of salmon gently grilled or pan-fried with only the seasonsings of salt and pepper, a single glass of rosé from the region and time to sit down and let the flavors dance upon my palette. As I mentioned in my Instagram stories, while I waited to check in to my vacation rental, I ended up in Menebre which was about 3 kilometers away. Completely by chance, a gourmet épicerie was still open on a Sunday and I spotted the tarte au citron. I pounced and along with the salmon, I brought “home” both dinner and dessert, and each was an occasion. 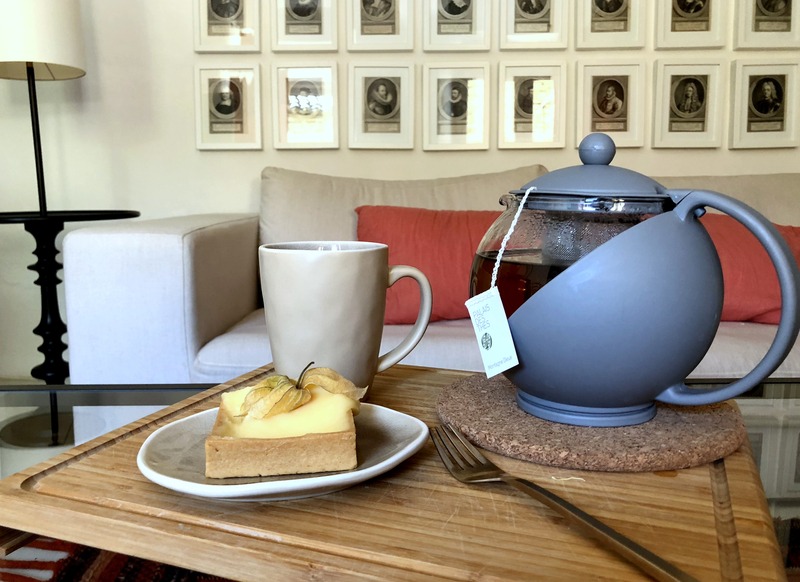 Of course, the dessert was served with a spot of tea which was a lovely pairing to let the day unwind and prepare for a deep sleep. Each season no matter where we call home, there is something unique and evanescent that will only be around a short time. 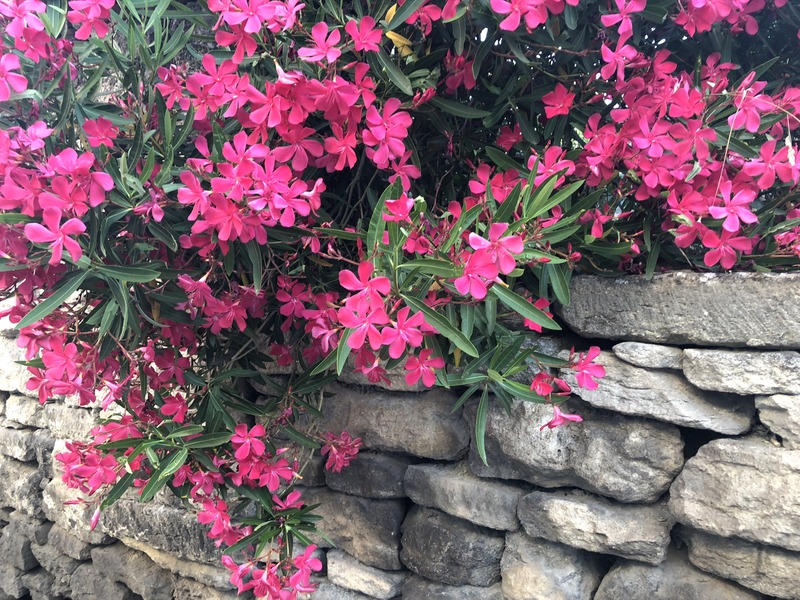 In this case, the early summer blooms that draped themselves over the old stone walls to say hello to drivers as they make their way through Gordes. Instead of walking past, I stopped, snapped a few photos and then a few more. It was stunning, the juxtapositing of the hard and soft, permanent and temporary. Whether you are a photographer or not, I find the best time to visit new places that are open for exploration without time limits in the morning. And while the evening would offer beautiful light as well, often more people are about, and as I want to experience the quiet, I look forward to starting my day with the discoveries of my excursions, and then moseying back home to savor even further. 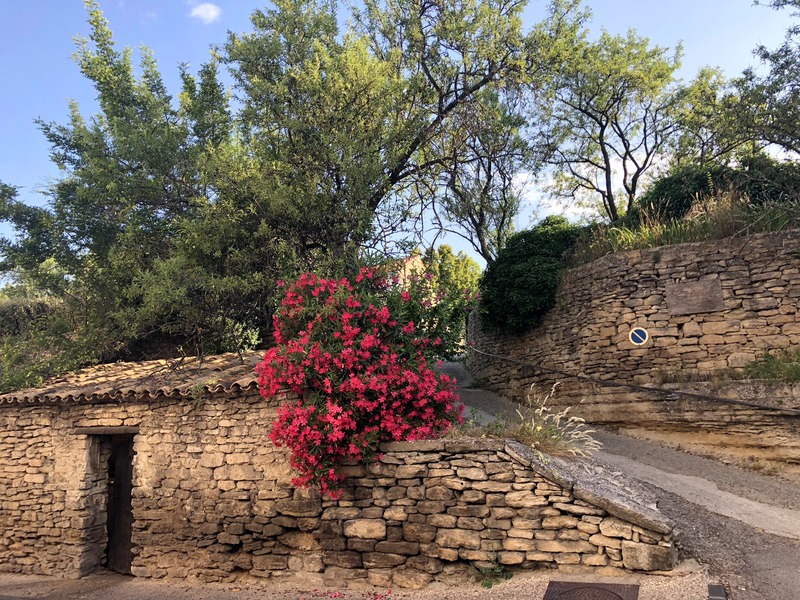 After visiting the market in Gordes and having a few morning hours left, I wasn’t ready to head home, so I hopped in my rental car and scooted down the road to Ménerbres. 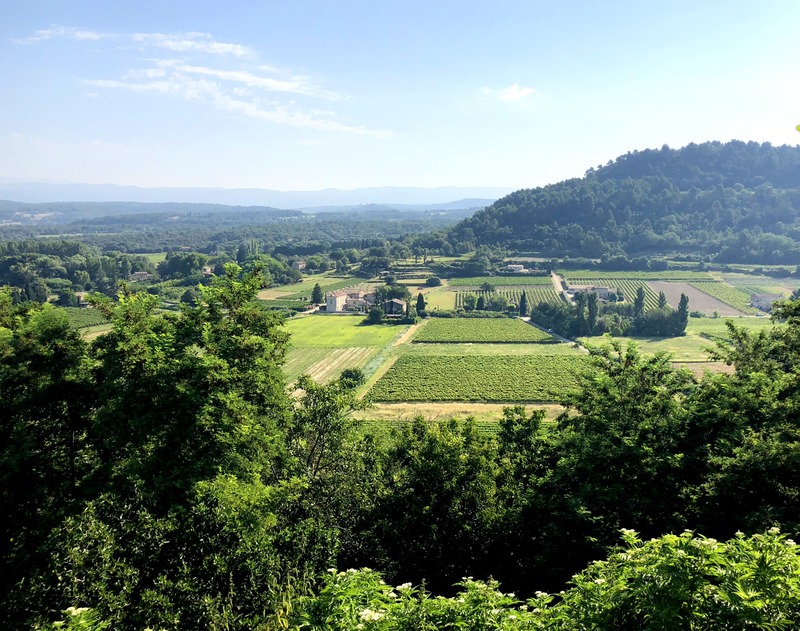 I wasn’t necessarily looking for anything which is sometimes a lovely way to travel as you have no expectations, and what I found was a boulangerie and beautiful views (see below). 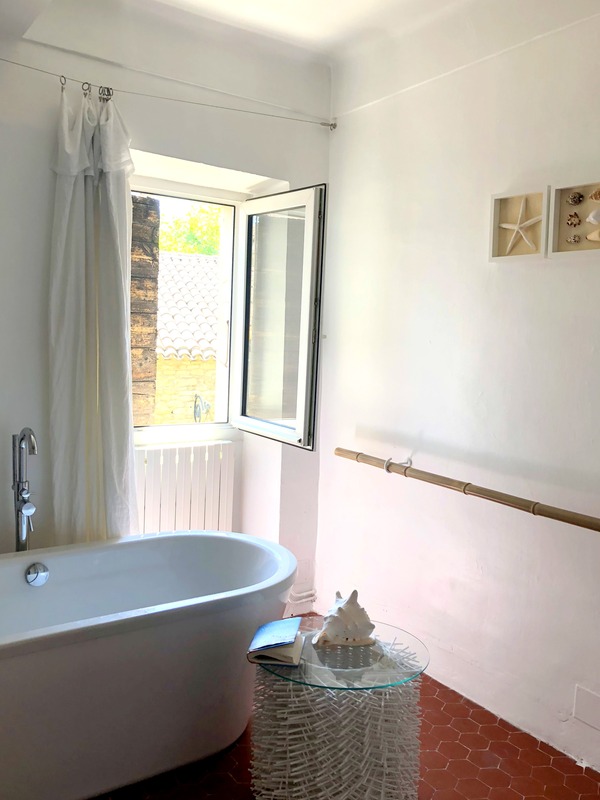 Initially it might sound crazy, but without a pool or an ocean, the next best thing to cooling down and relaxing is to hop into a lukewarm soaking tub, leave the window open so that breeze can join you and savor the feeling of warmth and cool all at the same time. Bliss. Absolutely bliss. There is this lovely corner of my courtyard at my vacation rental that is ideally situated in the shade for half of the day (morning into early afternoon). As I shared on IG on my first day, I have sought out this spot not only for the cooler temperatures, but also the view. The best distraction is wanting to look around me more than the page in front of me. Time is forgotten and my stress evaporates with the breeze. While this picture is taken during my lunch (you will see below where I ended up enjoying my lunch due to the heat), this is where I have been enjoying my breakfasts each morning. Entirely in the shade with the chirping of the birds, the greeting of the day by being outdoors with my tea, one sunnyside up egg and tartine, and a quick go at the mini puzzle from The New York Times, and the tone for the day is set with a smile. As I shared in this IG post yesterday, for the past week or so, lunch has been the grandest meal of the day. And so today I wanted to continue that idea as I found it to be quite lovely with its leisure, as well as time to savor, but then go about the rest of the day with the energy provided by the full meal. I decided to sit in the covered outdoor eating area which was vastly cooler due the stone enclosure. Again with a beautiful view and quiet surroundings, the cool cucumber soup made yesterday and chilled overnight paired with a quiche I picked up at the local boulangerie yesterday morning and a half a glass of rosé made for a reminder to reflect on the morning and be reenergized for the second half of the day (no matter what speed I chose to proceed at). My watch has not seen my wrist since I have arrived in France, and I haven’t missed it. Yes, I know, my phone has a clock, but unless it was the specific time that Patricia Wells wanted us at class, I have just been going about my days without worrying about the time. While I do try to arrive at the markets early, again, once I wake up, I will see what time it is, and then gently get started as I feel. While of course our work schedules require precision, when we are left to our own clocks, our bodies and minds tell us what we need. Food? What type? Okay, let’s make something or go shopping. Sleepy? Why not a quick nap. Have an idea? Grab your journal. Need some exercise? Let’s go for a stroll. I tend to follow this “body clock” during the summer when I am in Bend, and I love it. It allows me to get lost in projects, listen to my surroundings and enables me to feel at peace by the end of the day instead of exhausted. After reflecting on this list and all that I have experienced so far, I would have to agree with Paul Cezanne. When we master how to savor the everyday moments and elevate our experiences, we are knocking on the door of genius. 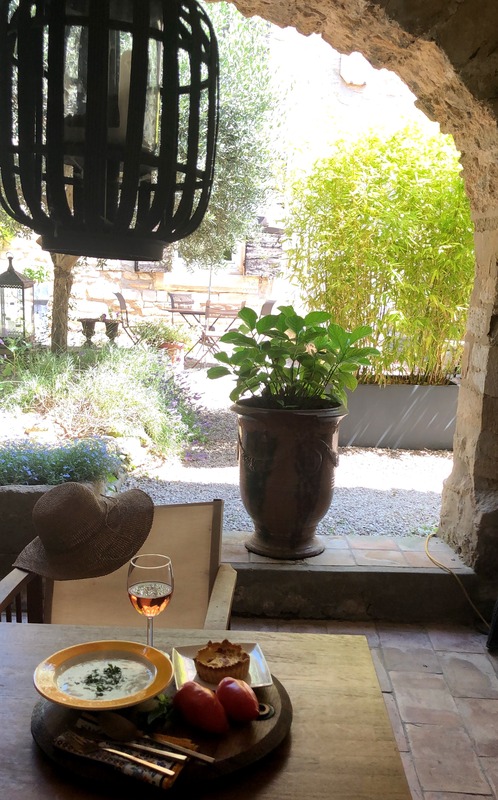 Beautiful simplicity , drinking in all the sights and sounds and scents around you, relaxing and letting go ; serenity and mindfulness are able to creep into your days , and are creating the many happy memories of Provence you will take with you when you eventually return to Bend. It is lovely to share your journeyings . Have a beautiful day, Shannon. Thank you for all these stunning photos and description- I can almost imagine myself in beautiful Provence. Choosing to ignore a watch and lose track of time is one of the best ways to truly relax, I find. And I completely agree about looking for ways to elevate the everyday- I dedicate a lot of time trying to do the same thing 😊. I think my reply went to Sarah, not Sue ! I’m in the UK too Sue. Isn’t this weather glorious ! The flowers are laurier-rose, or oleander. They are wonderful because they bloom generously all summer and require little water. 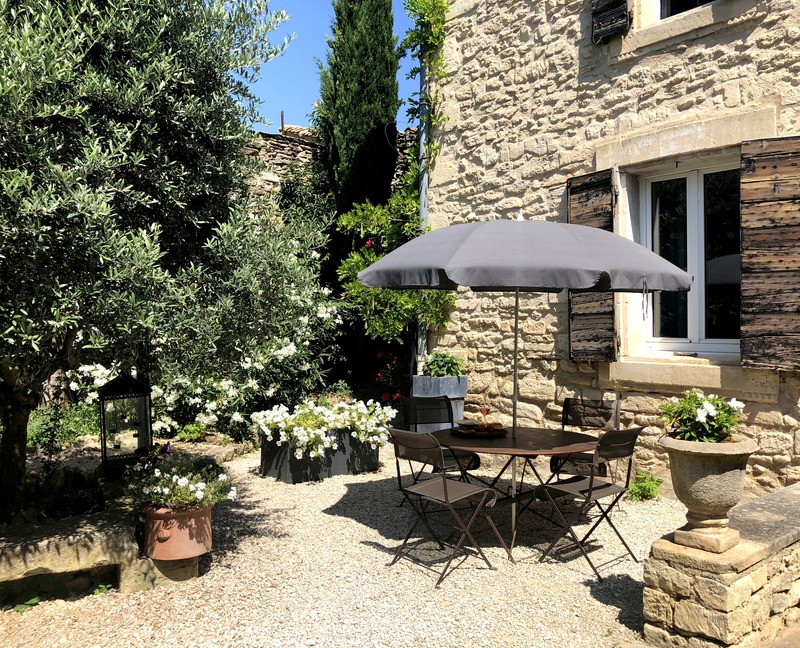 Re the coolness of the stone enclosure, something I appreciate a lot living in the South of France is the way the architecture has adapted to the climate (rather than adapting the climate to the architecture, as in air conditioning). Having a sheltered, shady spot makes it possible to enjoy all one’s meals outside for much of the year. Your pictures and recommendations were soothing to my soul. Thank you for sharing. This is the most beautiful blog site and one that I look forward to reading every day. I feel like you are living the life I dream about living. Thank you! You are very sweet and you absolutely can! Yours will be unique to you and your strengths and passions. You absolutely can. 🙂 Thank you for stopping by. Oh, Shannon. This is poetic. Just reading your posts and looking at your fantastic pictures lessens whatever stress I have. Your writing is sublime. Thank you for sharing! You are very kind Katina. 🙂 Thank you for spending a moment with me on TSLL. Wishing you a beautiful day. I feel as though I have been on a trip of a lifetime thanks to you, Shannon. I have been to France a few times, but your trip has been so thoughtful, and intentional. Also your pictures look like art pieces! You can feel the mood so beautifully. Thank you for enriching my Summer. Happy 4th July to you. I just wanted to say thank you for taking us along with you on your journey to France. The beautifully written posts and your wonderful photographs have been encouraging me to savour my own summer break in the Canary Islands before returning home to England as well as reminding me to make the most of all the summer season has to offer. You are an inspiration to all of us who follow along. What a lovely vacation to be enjoying. Thank you for “joining me” and for your kind words. Provence makes it very difficult to take a bad photo as the light is magnificent. 🙂 Enjoy the rest of your time on the islands. Lovely pix and lovelier reminders. The last is by far the best.